Just a few years ago, experts indicated Americans (especially young Americans) were more interested in a different lifestyle than previous generations. Instead of owning a house in the suburbs, the new American dream consisted of renting an apartment in the city. Recently, though, Americans of all ages have begun to leave major metropolitan areas like New York City and Los Angeles. Over the last five years, population growth in big cities has shrunk, and people are packing up and moving again. But where are they going now? We analyzed census data from the last five years to explore the counties and states where the most people are putting down roots. Let’s take a look. Living just a train ride away from Manhattan or a few hours from the Santa Monica Pier or Golden Gate Bridge might sound like the life—and for some people, it is—but people may now be looking elsewhere to settle down. 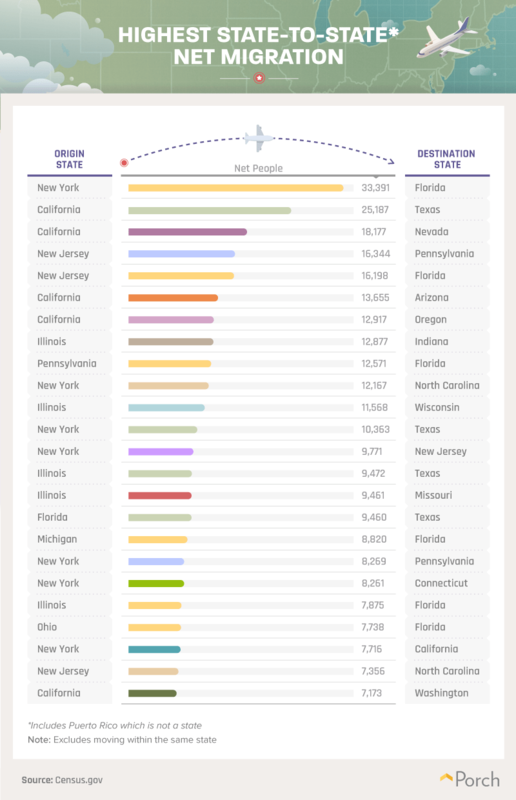 This graphic helps illustrate which U.S. states have seen the highest net migration, both in and out, between 2011 and 2016. As you can see, states in the Northeast saw a larger negative net migration, while Southern states had a strong influx of newcomers. Additionally, states with some of the most popular metropolitan areas, including New York, California, and Illinois, had substantial negative net migration as well. "There’s no place like home" is meant to convey that even when you live somewhere else, you’ll always have a certain fondness for your home. That is unless you can find someplace better. From the data, we learned there was actually quite a lot of back and forth between state borders. While a majority of people moving to the West Coast (including Utah, Washington, and Oregon) came from California, people from these states typically relocated to California as well. Similarly, people living in states like New Mexico, Oklahoma, and Louisiana generally moved from Texas, but people from these same states were also more likely to relocate to Texas. It’s no wonder, though, states like Texas and California continue to be popular destinations considering their successful employment rates. Of course, some states also come with a fairly hefty price tag. California and New York may have great job markets, but they also have the highest costs of living in the U.S. Looking to buy a home in California? The median home price is over $537,000—compared to roughly $213,000 across the country. So if some states are losing residents in droves, where are they going? For New Yorkers looking to leave behind the cold winters, high costs of living, and stagnant wages, there’s only one place to go: Florida. With its world-famous beaches and low personal income tax rate, Florida was the most popular destination state for people leaving states like New York, New Jersey, Pennsylvania, and Michigan. Even Californians are leaving the West Coast for Southern hospitality. In the past five years, an average of over 25,000 people left California for Texas. The tech industry has been relatively successful in certain parts of Texas, but unlike California, you won’t have to give up the majority of your salary to afford rent. 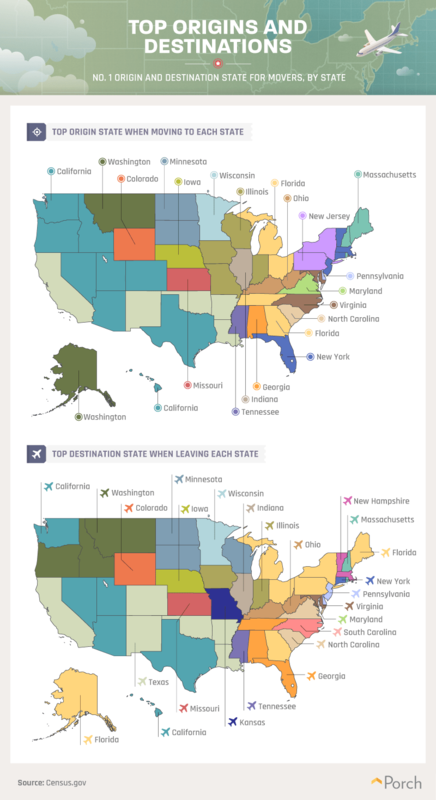 Nevada, Arizona, and Oregon were other popular destinations for people looking to relocate from California. While Florida certainly sees its fair share of new residents, more than 9,400 people have left Florida to call Texas home since 2011. The sunshine and celebrity sightings might be nice, but it costs a lot of money to live in Los Angeles. Where the average rent for a one-bedroom apartment is over $2,000, buying a home can set you back an average of $740,000, and even frugal spenders should expect to spend $500 or more a month on groceries. The cost of living might also help to explain why nearly 6,900 people have left Los Angeles for Clark County, Nevada. Every year, thousands of people give up their daily commutes on the 405 for the dry heat of Nevada, home to the University of Nevada, Mesquite, Boulder City, and Las Vegas. In Clark County, the median home price is less than $203,000, and a positive job growth means there’s plenty of opportunity for those looking to escape the big city life. In Cook County, Illinois (the second most populated county in the U.S. after Los Angeles and home to Chicago), almost 5,600 people have left for Lake County, Indiana. Thousands of people have also decided to leave Washington, D.C. Whether it’s the congested roadways, cost of living, or job opportunities, many have made their way to Prince George’s or Montgomery counties in Maryland from D.C. 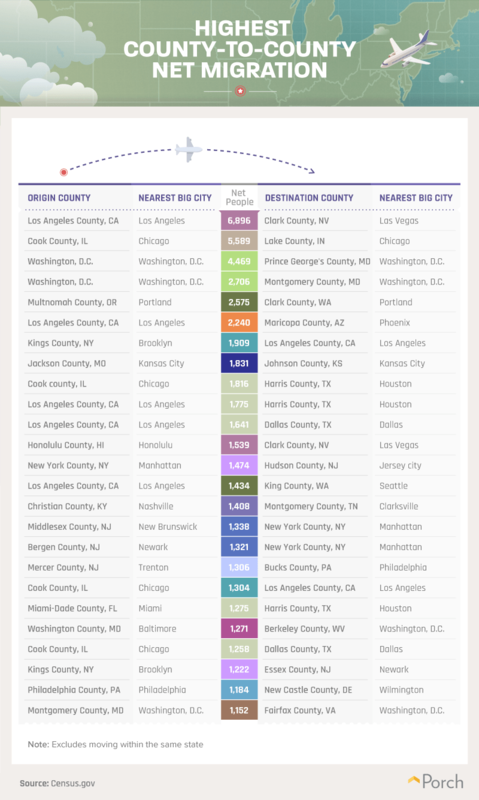 In some cases, people have left areas like California, New York, and Washington, D.C., almost as fast as they’ve moved into them. Only a few states have seen a much faster exodus than growth. Between 2011 and 2016, nearly 11 percent of Alaskan residents moved out of state, although there was less than 6 percent growth to replace their presence. This marks the first time in decades that Alaska’s population has shrunk, further compounding the state’s economic strife. 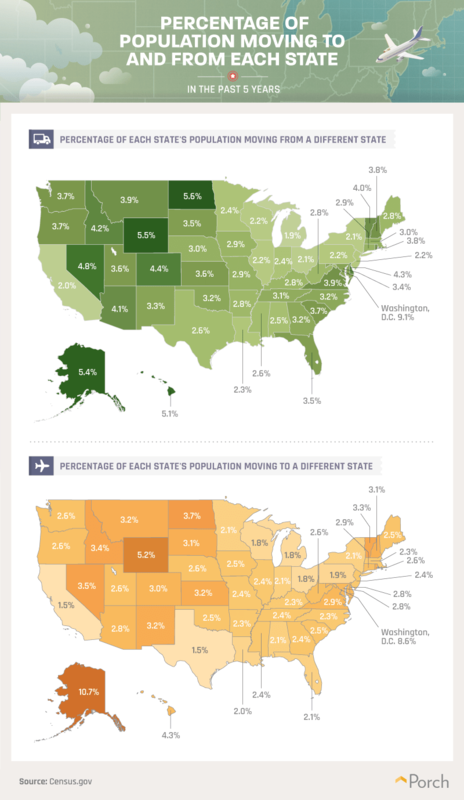 Since 2012, over 29,000 more people have moved from than moved to Alaska, and nearby states like Washington and California have become much more attractive to residents. However, many states are seeing the opposite effect. Despite the expense, more people moved to than from California between 2011 and 2016, New York saw hardly any change in its population, and a higher percentage of people moved to than from Washington, D.C., over the same period. Millennials are shaking things up. Whether it’s the way they shop, eat, or approach money, young Americans aren’t following in the footsteps of generations past—and that even includes their jobs. Studies have shown millennials aren’t afraid to do two things uncommon for older generations: jump from job to job and move from place to place. Considering relocating appeals to young employees, it’s no wonder the highest percentages of people crossing state borders were millennials. 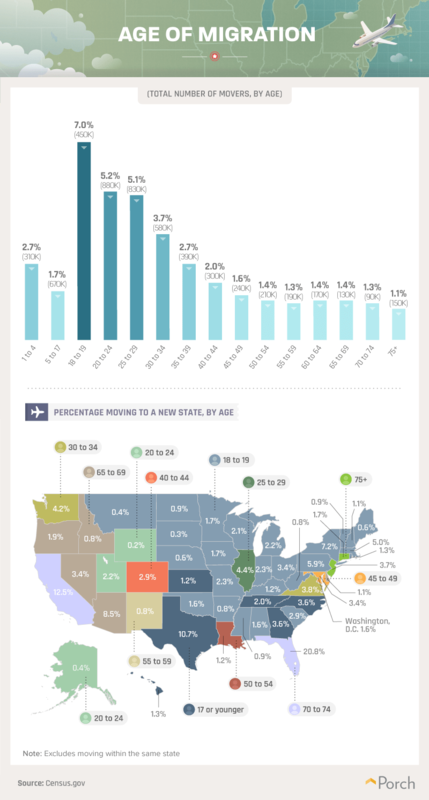 Seven percent of people aged 18 to 19 moved between states from 2011 to 2016. The next largest moving age groups were between 20 and 24 and 25 to 29. But where did they go? States like California and Florida were more likely to be the new homes of Americans aged 70 to 74, while young movers were more inclined to move to states like Utah, Wyoming, Alaska, and Illinois. When it comes to deciding where you want to live, there are many factors to consider aside from the location. As we found, the cost of living, job market, and industry trends likely play an important role in whether Americans pick up and move. Thousands of people do it every year though, including New Yorkers leaving the Northeast for Florida and Californians relocating to Nevada. Whether you’re coming or going, your house should feel like a home from the very beginning. At Porch, our goal is to help simplify the home improvement process from day one. Our free Porch Home Assistant is available 24/7 to connect you with professionals (or someone in our network) to manage everything from TV mounting to furniture assembly and lawn maintenance. Don’t let your to-do list get out of hand. Visit us at Porch to find the right professional for your next home project. 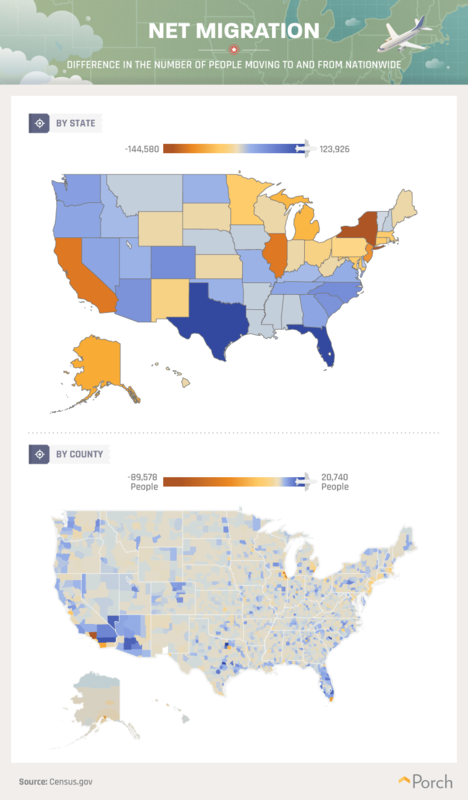 Using the U.S. Census Bureau County-to-County Migration Flows data, we analyzed where people moved to and from across the United States. We utilized the 2011-2015 Migration Flows data, which are the most up to date at the time of this writing. We looked at net migration unless otherwise stated, which shows the net gain or loss for a location-to-location flow. This is not indicative of the number of people who left the location, though. Since Census data relies solely on estimates, the figures presented above may not be inclusive of all migration. Home is where the heart is, right? Feel free to share the results of our relocation study with your readers for any noncommercial use. Be a good neighbor, though, and link back to this page so that readers can see our findings in their entirety and our contributors earn credit for their work.